A used Band-Aid in Flight Meal: Whose Fault it is? While travelling to Raipur yesterday morning in the Indigo Airlines flight (6E 453), my fellow co-passenger Mr. Kamlesh Vyas found a used band-aid in his breakfast meal. 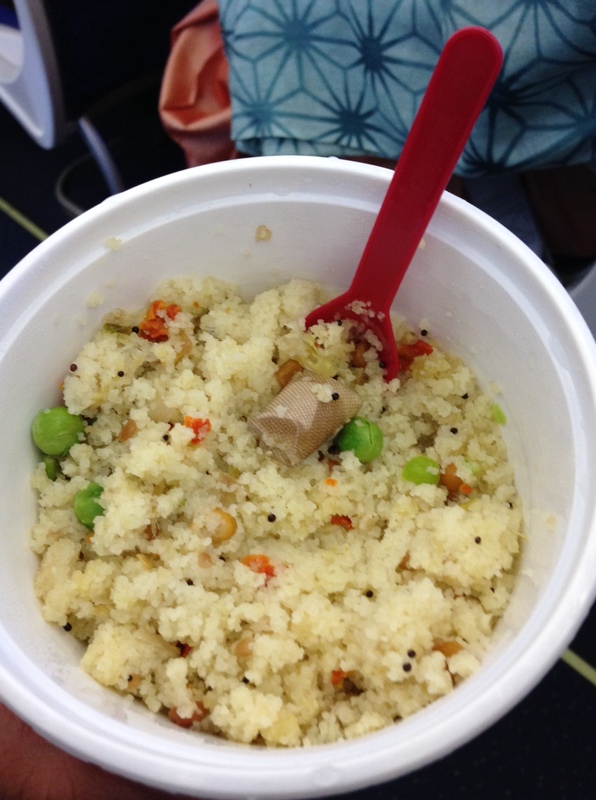 Apparently, he had ordered a vegetarian UPMA meal. Mr. Vyas was very upset on a seeing a used band-aid and he showed the meal to his fellow passengers including me. 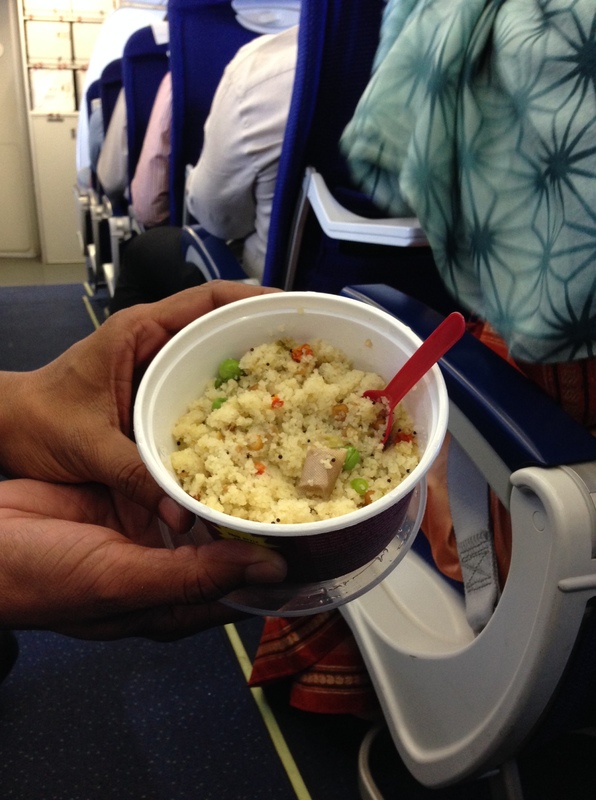 The air-hostess on her part apologised and offered to replace the meal but the damage had been done already. I had ordered a vegetarian manchow noodles but didn’t have the heart to eat it after this incident. So did Mr. Vyas who simply said no to the replacement offered by the flight hostess. Infact, while returning from Raipur yesterday via 6E 454, I preferred to skip the meal this time and opted for relatively safer options: cashew-nuts and lemonade. You become a little skeptical when something happens with you/around you 🙂 Incidentally, Mr. Vyas was in the same-flight sitting right ahead of me again. I believe he opted for a soup this time. He filed an official written compliment with testimonials from me and few other fellow co-passengers. We were asked to wait in the flight for few minutes as the flight captain wanted to have a word with us. I think they were doing their job nothing wrong about it. However, one of the ground-staff members asked us to go as the aircraft had to be prepared for its next flight. We went down with the ground-staff and requested him for a receipt of the complaint. He provided us with a Xerox of the complaint. We asked him about the escalation/solution and he mentioned that this will be routed to the central team. His answer was not definite and there was no clarity about the solution. How did the band-aid get into the meal in the 1st place? Is it purely the Chennai vendor’s fault where the product is packaged. (The packaging box had the name of the company in Chennai). In-flight staff are the last people to bear the brunt of the customers, but what can be done to curb such incidents? Are they trained to take care of such issues. Is it that a lot that happens behind the scenes during packaging etc. which we as consumers do not know about? The smart copy and branding 🙂 Unfortunately, it creates an opposite reaction when incidents like these happen. The band-aid in question. 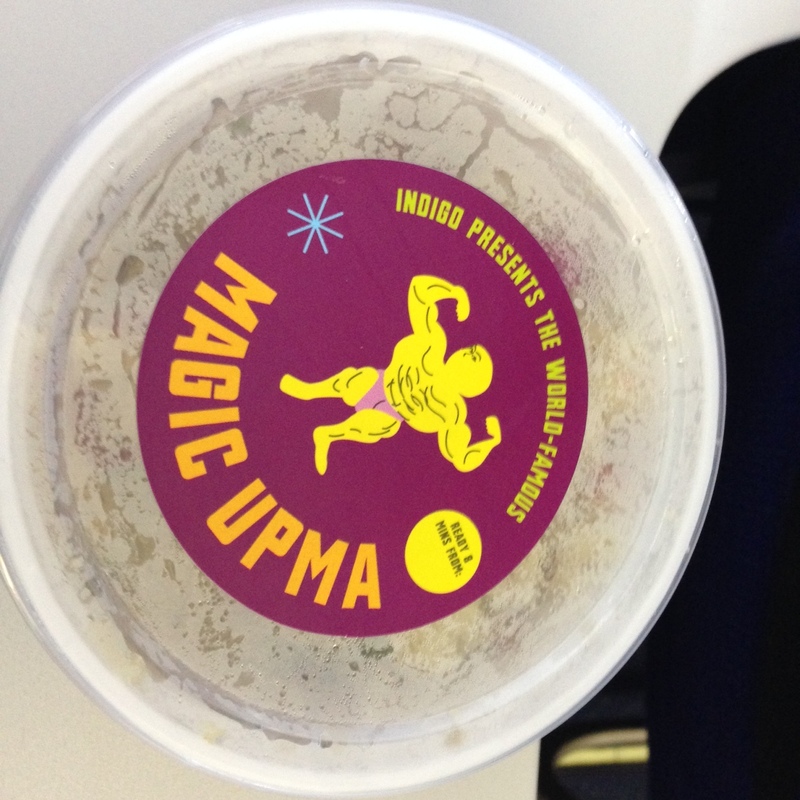 Quietly sitting in the magical world famous UPMA. The ground-staff at Raipur with the meal. The batch number and packaging date of the product. Everything good about it. Barring this one-off incident, my experience with the airline has been very good so far. I would continue to travel with them, no question about that. Absolutely nothing against the staff, but such incidents need to be fixed. I am hoping that the airline finds out how this happened and sets up a robust system in place to ensure incidents like these can be avoided in future. This post isn’t meant to criticize our culture or our organizations. 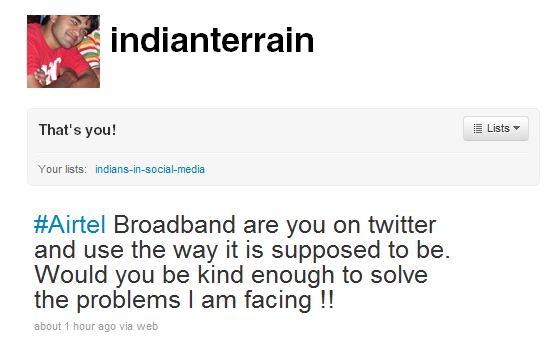 Neither is it meant to be a rant which is the outcome of frustration while dealing with a service provider! It is a reflection of an observation which explains the behavioral patterns of organizations in India when coordinating with their customers! Perhaps this isn’t for the first time that we’re talking about the soft issue of “Customer Service”. The bottom line is that bulk of Indian companies continue to struggle on the sticky support wicket despite a tremendous opportunity due to the growth of Social Media channels. Our recent experience with a leading provider of web-hosting is a classic case-study of the wide gap that still exists b/w India & parts of the Western World when compared on the “Customer Support” front. In my opinion, our key learning from this experience is the existence of mind-set difference. While we consider consider customer support just like any other job and a department in the organization, for companies in States it is something that ties in with overall experience. Our organization had recently switched over to a VPS hosting package with the idea of improving response time of hosted apps & web-pages as well as cutting down typical problems which arise with shared hosting packages! The underlying goal was to serve our customers better than ever before. During the selection process, we did our bit by researching for preferred vendors in this space across India & United States. While the services being provided by all vendors were quite similar, we were particularly looking at someone who was strong with Services Support & was carrying a trusted name in the industry. The other problem was limited options that we had in India. Being customers of companies like BigRock and ZNet India we have had mixed experiences with them and weren’t quite keen to experiment with an unknown hosting company as it would have put the reputation of our customers’ at stake. It was then that we learnt about a popular American hosting company that had recently started its operations in India. Since we were well aware of their unit which is among the most popular companies up in the U.S. we thought it might be a safe bet to go with their Indian arm. We freezed the option, went ahead with our order and the next step was migration of our current online assests to the new server. To begin with, we faced severe migration problems and our company website www.iffort.com was down for ‘2’ days being in no man’s land. We faced long delays with email delivery and major down-time resulting in switch to our personal emails for the interim period. Lastly, a couple of our customer portals went down. Amidst all these, we were using all possible means to connect with their India team to understand the crux of the problem. Be it Online Chat, Email, Twitter, Facebook or Phone, we used all of them. Honestly, we had strong doubts whether the team actually understood our problem. Perhaps they were new, perhaps they were taking time to setup in an structured manner but whatever the reason was, we knew that our organization was suffering due to all this. After constant cross-talk, Sunny did manage to hook-up with the team’s India Director. Alas we had to threaten them of dire consequences and send numerous emails. Finally, we received a reply from their India director that he was in-charge of key issues and was himself traveling out of India. But I think one of our emails served as a trigger in their mind and what followed then was a rescue operation led by their India Director & everything was restored to normal overnight. Like I mentioned, it was one of those emails. That one email where we had marked the group’s global CEO who was based out of United States. So finally the problem was solved, things were restored but that didn’t stop us from exploring our options because all the love had already been lost. Damage had been in the form of what we’d experienced over the course of “2” weeks. All in all we had lost faith to do business with the company! We wanted to switch to a different provider and deal with a new set people all-together. After a lot of introspection, we moved to a new company! But here was the catch: We were will sticking with the same brand & were just moving over to their team in United States which was legally a different company! It was ironical that our experience with their US team was absolutely contrasting and diametrically opposite to the local team. I agree, they’re very new and with it being staffed just by Indian support there is going to be a learning curve. Eventually we’ll need to figure out a better system so that US support has access and can help when they are messing up. I’m very sorry for this. What’s your take on this? Do you think India still has a long way to go when it comes to actually understanding the whole meaning and implications of Customer Service! What is your experience like! It was one of those evenings, when we were not in a mood to work. The day had already gone by and the office was half-empty. Thinking what to do, we thought of decorating our office with some quotes. Quotations which were inspirational and motivational. Amongst the many quotes that we did stick on our workstations, one of them was really inspiringly. It was the one by ‘Steve Jobs’ and it was simple yet very effective. Reading this quote and thinking about it from a service provider’s role, I tried to re-collect incidents where we actually could have been better. Scenarios, where we thought that we had solved a problem, but the customer differed. The flow of thoughts continued till I switched role/s and stepped into the shoes of a customer. “When was the last time I faced a problem? Am I facing any problem right now?” I asked myself. I hadn’t event finished the above question and I quickly recalled the argument that I had with the customer service executive of our internet service provider. Barely a month ago we had taken a new internet connection from Airtel. The traffic demand in our office was quite heavy and to do a load-balancing we had made a request for another pipe to ‘Airtel’. We were bombarded with different calls from the sales-executives of ‘Airtel’ and all of them were requesting that elusive appointment which would have helped them to convert a lead into actionable sale. In the beginning when got these calls, we thought there could be some mis-understanding. But when, the calls didn’t fail to stop, we realized that it is more than just mis-understanding. It is a fundamental Sales-Process problem, where executives are more focussed towards achieving their sales targets. Whether that also means using other executive’s database is a different story all-together. Our misery didn’t end here as post installation, we faced common problems of poor internet speed. The worst was yet to come. On a bright sunny afternoon, I got a call from their executive who said, “Is this ABC Consulting?”. Realizing that she had dialled a wrong destination I told her about the same. However, to my surprise I realized that the details of the connection and telephone that were allocated to us were exactly the same. On digging deeper, we found out the crux of the problem. We were allocated a connection which was already being used by another brand. Whether the company was still using it or not we were not aware of it. However, one thing was for sure we were let down. We were let down badly by a brand for whom we had high regard and trust. But now everything was broken. It was not that we hadn’t faced problems in the past with Airtel. It was just that we were aware of their strong support service. We knew that somebody would fix the issue within the blink of an eyelid. We called up their support executives who promised a quick resolution only to never return. We kept on building a pile of different ticket numbers for the same problems. Realizing the problem, we explored the army of social media tools. The first and the last of them being “Twitter”. The conversation began with my first tweet. I then searched for ‘Airtel’ and came across three ids. In the meantime some well-wishers and some one from ‘Airtel’ had also replied. I thought a brand like ‘Airtel’ would understand the essence and meaning of Social Media. But through their tweet, they were simply directing me to another email id. I wasn’t so sure as to why they were using ‘Social Media’. If directing users to another email id is the job why didn’t they simply create a twitter profile with one big message which states the email address. They had event posted a tweet for Blackberry India. Again it was the same message !! Off-course Blackberry India, never had a problem with Airtel. It was just that they had mentioned ‘Airtel’ in one their tweets. This poor automated program, picked the keyword ‘Airtel’ and was posting the same old message for everyone. It wasn’t human for sure, it was ‘Automated’ and was understandably defeating the whole purpose of conversations through Social Media. 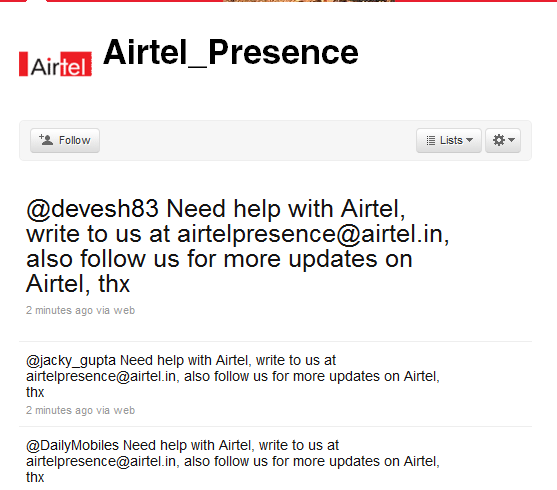 Dear Airtel – Do you know why using are using twitter? Do you know what is ‘Social Media’? Do you know how you can solve the problems of your customers? Above all, do you know what is ‘Customer Service’? ‘Where are the booking forms available?’ Ramesh asked the sales executive at a leading car showroom in Bangalore. ‘Sir, I am not sure about the booking dates, but I do believe that you should visit Auto-Expo in New Delhi. ‘Yeah, you’re right Sir !’, the sales executive answered. A man in his early 40s, Ramesh walked out of the show-room and headed towards his home. Back home, children were waiting for their dad to come. The bell rang and they opened the door with excitement in their eyes. To their happiness, dad told them that they would be going to Auto-Expo 2008. Everyone was excited, as they knew they’re going to get its glimpse. Yes, Ramesh’s family could now think about buying it. All his life, he had been traveling on a two-wheeler scooter. With his four-figure monthly income he couldn’t even dream about affording a luxury called as ‘car’. But suddenly from nowhere, some-one had given him hope. 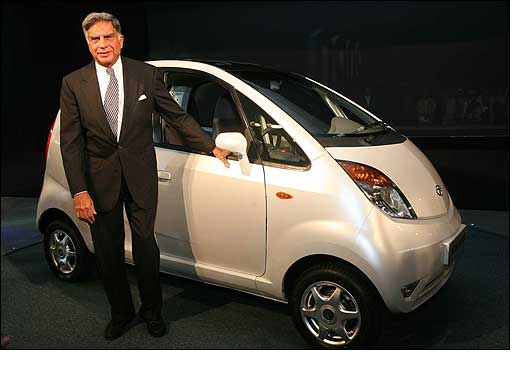 A man born in the streets of Mumbai on December 28,1937, a man called Ratan Naval Tata had raised his expectations. After-all, it was Ratan’s promise to the nation. The promise was about a car! A car which was termed as the car for a common man and Ramesh had every right to consider himself as a common man 🙂 Ramesh had only one man and one brand to thank for it. Ratan Naval Tata and brand behind it i.e. Tata Motors. Well that was about two months ago ! Today, the whole nation is swooning over Tata’s new car available at a cheap price of 1 lakh Indian rupees. The name of the car is Tata Nano and Ratan has fulfilled his promise 🙂 with full-support from the engineering team by unveiling it at the Auto-Expo which is being organized at Pragati Maidan. As for Ramesh, he happens to be just one among the billion.